I created the module and added all the native libraries for Windows and Linux, Toni added the native libraries for Mac OS X today. So, in principle, when you download the module and add it to the application as shown above, the application should start without a problem and display the JavaFX component regardless of the operating system you're using. The downside is that you end up with a gazillion native libraries in your application since it is unclear which native libraries are actually needed, so Toni and I simply included literally all of them. Feedback on this module would be much appreciated, including code contributions. Would be great if someone added next/prev buttons to it, for example. Note: This module is completely experimental and sooner or later you will have some kind of problem with it. 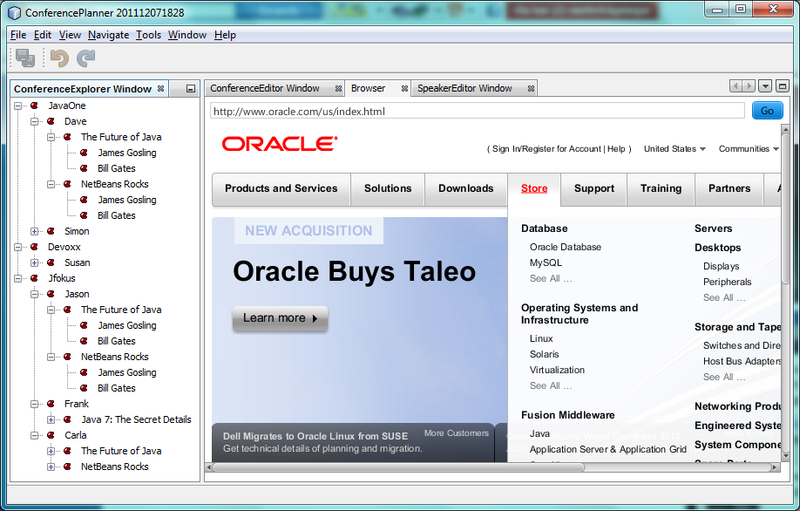 Nevertheless, would be great if several NetBeans Platform developers would try it out and give feedback. The conventional way to handle the platform-specific libraries is for the master module to require a token; then each autoload platform module bundles one set of libs, provides the token, and requires the OS token. Of course you no longer have just one NBM, but you can have just one update center. We did this for e.g. the XUL runner, and in 7.2 also the masterfs native FS notifiers. Of course it would be nice if JavaFX generally were packaged properly as a library wrapper, with the NB browser integration (preferably an impl of HtmlBrowser.URLDisplayer) done as a separate module. I guess such a JavaFX browser is based on WebView, isn't it ? But it's quite evolving into the right direction. It's very promising. I wrote a post "JavaFX may be the next Adobe AIR"
Having embedded WebKit into JavaFX was a great step into that direction. which is the difference with the web module in javafx? I require some Guide . I have Total 5.6 yrs of Exp in Oracle Forms,Oracle Report ,Oracle PL-SQL and Performance Tunning . I want to swith my career in Oracle Apps what can I do for same .Can give me right guide for same . This looks really promising, but doesn't seem to work in x64 windows - is that expected? I created the module on x64 windows and it works perfectly there. I checkout from svn and run it. every thing is fine. But when i upgrade javafx to version 2.1 a browser will disappear after netbeans layout was changed. I run on windows 64bit but use 32 bit jdk. Is you has same problem?